On the market, there are numerous drones, each with its own merits and defects, covering the most disparate price ranges. Interested users (especially newcomers who want to spend no more than $100) are often in a phase of indecision due to the enormity of products available for sale, for this reason it seems necessary to analyze the best alternatives below this threshold. Obviously, on this price range, you cannot expect performances worthy of the sophisticated DJI Phantom and GoPro Karma, but those presented below are objects that, in relation to the price range, perform their work very well. The first drone of this collection is the Blade Nano Qx BNF. The size and low weight make it look like a drone that has some important shortcomings but instead has some interesting features. In fact, it is equipped with ASFE (Sensor Assisted Flight Envelope) technology, which limits its impact during take-off / landing and is excellent for less-experienced users. The main fear that afflicts the neophytes is to hit the drone against walls and / or things risking to cause damage with the propellers in motion, but do not worry the solution is called UDI U818A. This drone, thanks to its light (but resistant) structure it is able to incorporate the propellers and at the same time is equipped with a software that prevents (but does not completely) the possible collisions. It also has a camera with a resolution of 640×480. 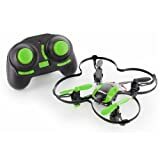 This little quadricopter is undoubtedly a best seller! Its excellent quality / price ratio and its easy and pleasant use give this product the best purchase crown for this price range. Obviously, it remains a product for newbies: no camera and no sensors, just lots of fun! This drone equipped with a folding and flexible body offers an advantage from the point of view of transportability that has no equal. 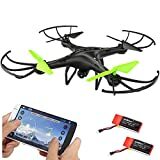 The battery in the kit manages to reach a range of flight that is around 7-9 minutes (factor is influenced mainly by the camera on the front of the device and the LED lights that allow you to shoot video / take pictures even in low-light conditions). Last, but not least, this drone from the Cheerwing, which has a very simple but at the same time delicate design and is equipped with an HD camera integrated into the body. Without doubt, the possibility of connecting your smartphone to view recorded images live is very interesting, but as usual this particularity has a negative influence on the autonomy of the product.